You’ve all heard of food co-ops, but what about buying into a whole neighborhood? That’s exactly what the NorthEast Investment Cooperative (NEIC) in Minneapolis is doing. By donating a portion of its services, McMonigal Architects partners with NEIC on proposed renovations to commercial properties. We work with NEIC and potential tenants to develop economical solutions that aim to sustainably reuse and bring new life to tired and vacated old buildings. Extensive field measuring and investigation, detailed code analysis, and creative design solutions for the building facades are part of the process. Taking a ride with Recovery Bike Shop and NEIC! Northeast Investment Cooperative, (NEIC) is a new cooperative whose goal is to improve the quality of commercial and residential properties in NE Minneapolis. Its first venture is to rehabilitate and lease a large commercial property at 2506 Central Avenue NE. Recovery Bike Shop, a bike repair and resale business plans to move into the adjacent 2504 Central building later this spring. 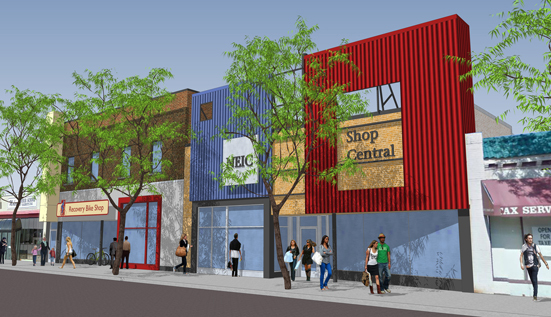 McMonigal Architects is thrilled to partner with NEIC and Recovery Bike Shop in this project. Both existing hundred-year-old buildings have seen better days. As NEIC board member Chris Bubser says, “the buildings have nothing but potential”. Our design challenge has been to transform two bland but distinct facades- one mostly brick, the other mostly metal- into one energized, unified whole. The existing large corrugated metal facade at 2506 Central has become a symbol for NEIC’s cost-conscious investment strategy: “How do we make an asset out of a liability?” Rather than completely remove the siding to expose a low, non-descript building, we chose to celebrate the industrial aesthetic by cutting out portions of the metal to expose the structural bracing, brick, and sky beyond. This approach limits the amount of material to be removed and transforms the existing metal siding into an attention-grabbing billboard. In a newly rehabbed commercial property on a busy street, the businesses will need to attract attention yet visually fit into the existing neighborhood fabric. This conceptual design does both. Along with NEIC and Recovery Bike Shop, we are eager to “get the project rolling”. Visit NEIC and hop on the journey with us!